Finding the perfect chew toy is a constant struggle for those of us living with extreme chewers. Our last dog Lucy, a Rottweiler mix, posed the biggest challenge for us. She managed to get pieces off of even the most durable toys. These are some safe chew toys for dogs – and some to avoid – if you have a chewer in your life, like Lucy. 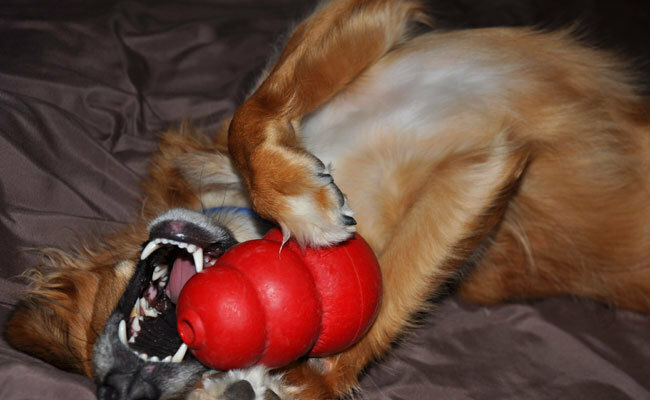 The Kong has been a favorite with dog owners for more than 40 years. This toy is made of durable rubber that’s extra bouncy and has a hollow center for holding treats inside. The Kong is popular at animal shelters where toys are a big part of the enrichment program for dogs. At Bloomingdale Regional Animal Shelter, NJ Ellen Ribitzki said the Kong is a big hit. Shelter workers stuff them with peanut butter and kibble and freeze them overnight to provide even more chewing pleasure for the dogs. This dog bone made by the JW Pet Company, Inc. is a dumbbell shape with textured nubs to help keep teeth clean, stimulate gums and promote oral health. This company has been recognized at the Global Pet Expo for focusing on intelligent designs that help make their toys dog proof. This chew toy is made of durable, tough natural rubber that the company says is designed to withstand even the most powerful chewers. Sixty-one percent of dog owners gave this toy five stars on Chewy.com. This dog chew toy from West Paw won Best in Show for dogs at the Global Pet Expo in 2017. The Qwizl is a pliable durable treat-dispensing toy made from the company’s exclusive Zogoflex material. This toy is non-toxic and latex free. Sixty-nine percent of dog owners gave the Qwizl a five-star review on Chewy.com. Many of the reviewers reported that this is the only chew toy that has stood up to their aggressive chewers. The 3-Prong Chew Toy is just one of the many chew bones promoted for extreme chewers by the Nylabone company. This bone has a multi-textured surface that helps to clean a dog’s teeth while keeping him or her busy for long periods of time. The Nylabone company has been making dog chew toys since 1955 and offers an impressive selection of bones designed especially for aggressive chewers. This one topped the review list of “Super Durable Dog Balls for Fetching and Beyond” published in the August 2017 issue of The Whole Dog Journal. The ball is made from eco-friendly materials and is free from chemicals like BPA and phthalates. A small amount of peppermint oil has been added to the material to give it a minty scent. Veterinary experts say it’s important to supervise how your dog is playing with his or her toys. Many chew toys are safe for some dogs but not others. Rope toys, if ingested, can cause life-threatening intestinal obstruction. Hard plastic toys in a power chewer’s mouth can splinter and cause intestinal damage. Experts at the Humane Society of the United States recommend seeking the advice of a veterinarian before giving your dog a rawhide bone. These chews should only be given when you can supervise your dog as they may pose a choking hazard. It’s a good practice to go through the dog toy basket periodically and get rid of toys that are starting to break into pieces or are torn. For extreme chewers, also avoid the toys below, which can be dangerous. While tennis balls are fun for dogs to fetch, they are not safe as chew toys. According to experts at the American Veterinary Dental Association, these balls are abrasive like scouring pads. If dogs chew on these balls every day for years it can cause significant wear to their teeth. Tennis balls also pose a choking hazard. Aggressive chewers can easily swallow pieces of the material they rip from these balls. Latex toys with bells or squeaks inside are fine for tossing around but if left alone with these toys, your power chewer will use those teeth to get to the squeaker or bell. These parts are small and can easily be swallowed. The danger with these toys, writes Veterinarian Virginia Sinnott on the Massachusetts Society for the Prevention of Cruelty to Animals-Angell Animal Medical Center website, is that the single hole can create a strong suction causing the toy to get stuck on the dog’s tongue. There are no federal regulations in place to ensure the standards of pet toys. Instead, it’s left up to manufacturers to establish standards and to test and issue recalls if necessary for their own products. Dog owners need to be diligent in reading labels and researching companies to make sure they care about pet safety. Experts at Preventivevet.com recommend being especially cautious about purchasing dog toys and chews that are manufactured overseas if you can’t verify what’s in them. The same holds true for cheap dog toys made in the U.S.
Every chance she got, our dog, Lucy, was chewing on sticks and twigs in the yard. The problem is that wood splinters easily, and pieces can get stuck in a dog’s mouth causing an infection. It’s also really easy for dogs to swallow pieces of wood and this can cause an intestinal blockage. In addition, according to an article in the July 2016 issue of Animal Wellness magazine certain trees such as black walnut, black cherry, yew or red maple can be toxic to dogs. Unfortunately potentially-dangerous dog toys continue to be sold without adequate product standards. Since dogs carry toys about in their mouth, where harmful substances can be absorbed through the delicate mucous membranes, the safety standards should be at least as rigorous as those for human children, but sadly I don't think there are any safety or product-testing requirements for pet toys at all. Or at least I couldn't find any when I searched. When are manufacturers going to listen to dog and cat owners who just want to provide safe toys for our companions. Very toxic chews: hide bones!!! They even have embalming substances. Avoid!!!! The Nyalabone is not vegan but there are are make that are vegan like the Marrow Bone (which doesn't have animal marrow but a sort of Marmite: our dog is very keen indeed. My dog destroyed a kong.